Multi-Mania is happening again on May 19 and 20th, its been a few years since I last presented there but am happy to be back for this edition doing a session on "Web Components - Building Blocks for the Web". I've been spending a lot of time recently getting hands-on with web components and its related technologies (custom elements, HTML imports, Shadow DOM,... ) and look forward to sharing more about this soon. Over the next few weeks and months I'll post some articles and video tutorials following up on my presentation that deep-dive into each of the topics. Hope to see many of you in Kortrijk, Belgium - the conference is free of charge and there are still some tickets available, be sure to register soon! 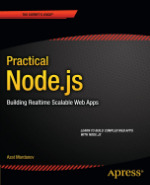 Its been a while since I last did a tech review project but could not refuse helping out on a very interesting book Azat Mardan has coming up called "Practical Node.js - Building Realtime Scalable Web Apps". The publication is scheduled to come out in June but is available for pre-order now. Its been well over a year since I last blogged and am finally getting round to setting something up again. The old blog with articles from 2003 until 2012 is now being retired and is available as an archive. I'm currently working as a Web Solutions Engineer in Creative Innovation at Google and new posts will likely revolve around my latest interests including (but not limited to) HTML5, Python, App Engine and a various Google APIs. That said, here is the standard disclaimer: any views expressed here are my own and do not necessarily reflect those of my employer. I expect to have a first post up later this week and hope to see you around!